Sydney Sixers 8-164 (Michael Lumb 33, Steve O’Keefe 32, Alfonso Thomas 2-36) beat Titans 5-163 (David Wiese 61*, Henry Davids 59*, Mitchell Starc 2-33) by two wickets. 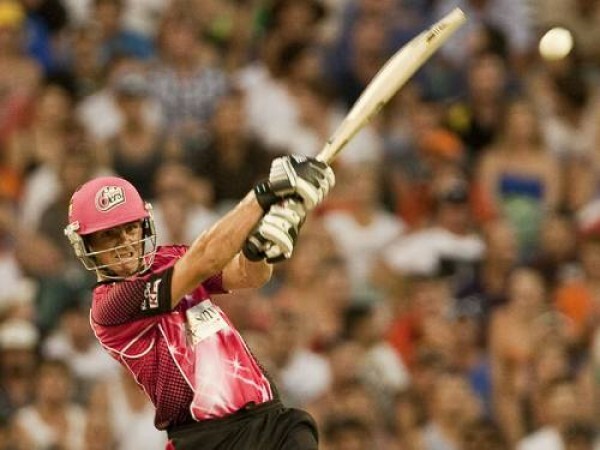 Sydney Sixers won the cliff-hanger against Titans with determination while keeping their nerves cool in the semi final of Champions League Twenty20 2012. Titans scored 163 runs for the loss of five wickets in the measured 20 overs. Sydney Sixers were fighting at one stage but thrashed 164 runs with two wickets in hand and became victorious. Steve O’Keefe (Sydney Sixers) was declared ‘Player of the match’ for his brilliant all round performance in the game. He gave away only 19 runs in four overs and contributed important 32 runs while opening the innings. The second semi-final of the Champions League Twenty20 2012 was played at Supersport Park, Centurion, on Friday, October 26, 2012. Martin van Jaarsveld won the toss for Titans and preferred to bat first on a nice looking batting track. The decision did not pay off well as the first wickets went down for just two runs in the very first over. Heino Kuhn joined with the opener Henry Davids and the first dispatched 3 fours in the next two overs. Davids hit the first six of the match in the fourth over but Heiono Kuhn lost his wicket on the last ball for 13 as the total reached 22. The worries multiplied when the skipper van Jaarsveld became the third victim and Titans were struggling at 3-36 in 5.3 overs. Henry Davids looked the only solid batsman who survived against the lethal bowling of Sydney Sixers as the wickets kept on slipping from the other end. Titans lost half of their side for 82 runs in 13.3 overs when David Wiese appeared on the scene and associated with Davids. They took the score to 91 after 16 overs as Wiese came at his own and gathered 15 runs in the following over with 1 six and 2 fours. Wiese punished Moises Henriques for 19 runs in the next five deliveries comprising two lofty sixes and one four as Henry Davids completed his 8th T20 fifty on the last ball of the 18th over with a four. David Wiese powered his second T20 half century in the 19th over with a couple of fours and remained unbeaten for 61 off 28 mere balls with 4 giant sixes and 6 fours. Henry Davids secured his end for 59 off 44 with 3 huge sixes and even fours as the Titans smashed 163 runs at the close of the 20th over. Mitchell Starc was the top wicket taker with two whereas Josh Hazlewood, Pat Cummins and Moises Henriques claimed one wicket each. Sydney Sixers initiated their innings reasonably well with Steve O’Keefe and Micheal Lumb. Both batsmen got 2 fours each in the first two overs as Lumb added another three and O’Keefe gathered two more by the end of the fourth over. The aggressive partnership resulted in 54 runs while consuming just 4.5 overs when Michael Lumb was gone for 33 off just 19 balls with 1 six and 6 fours. Nic Maddinson joined in next with O’Keefe who kept on the tempo of brisk scoring with regular boundaries. Steve O’Keefe was clean bowled by Eden Links for 32 off just 21 with 6 fours as the score touched 85 in 8.2 overs. The Titans bowlers came back in the game by picking three quick wickets including Maddinson and the Sydney Sixers were reeling at 5-113 in 12.3 overs. Moises Henriques and Ben Rohrer stopped the invasion of the rival bowling while adding useful runs. The score was enhanced to 132 as Henriques went back to the pavilion for 28 off 18 with 2 sixes and 1 four. Ben Rohrer kept the hopes alive for Sydney Sixers as 19 runs were required to win the match on the last 12 balls. Pat Cummins hit a six in the 19th over and was dropped on the last ball of the over and the margin was reduced to 8 in the last 6 deliveries. Rohrer departed back to the dressing room on the second ball of the last over as the target was achieved on the last ball of the 20th over. Alfonso Thomas was the highest wicket taker with two as Eden Links, Ethy Mbhalati, Cornelius de Villiers and Roelof van der Merve shared one wicket each. Sydney Sixers won the absorbing encounter with a margin of two wickets and have qualified for the final of Champions League Twenty20 2012. They will face Highveld Lions in the final on October 28, 2012, at Johannesburg.